We've just released a handy new feature ready for tax time: the ability to categorise your material and project adjustments. This can be really handy for tracking your personal use stock deductions, damage and other adjustment reasons. You'll now find in your category list area a new tab for your adjustment categories. As with the other category sections, you can add as many categories as you wish. To save you time, we've created a "Personal Use" one for you. This is a special category that is factored into your Schedule C report under Line 36. Purchases less cost of items withdrawn for personal use. We've also two new reports to show your adjustment breakdowns. 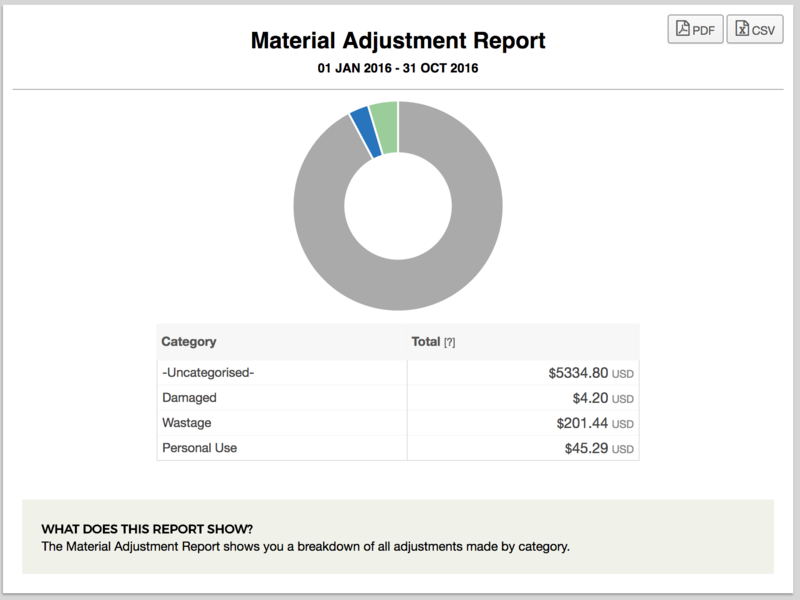 Your Material Adjustments Report that contains a breakdown of all material adjustments you have made by category, while the Product Adjustments Report deals with the same for your project adjustments. This can be really helpful when analysing your adjustment history.